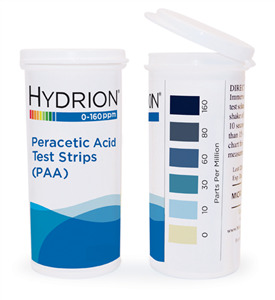 PAA160 measures the concentration of PAA from 0-160 with match points covering the critical ranges for anti-microbial fruit and vegetable rinses. Packed 50 strips in a desiccant lined flip-top vial. 6 vials per box. Immerse test strip for no more than 1-2 seconds. Remove from solution and immediately shake to remove excess solution. Match at 10 seconds (not more than 15 seconds) to color chart for accurate PAA measurement.